EDWINS is a unique restaurant. The brain child of restauranteur Brandon Chrostowski, it is billed as “a hospitality center training ground for individuals seeking successful re-entry into the professional world.” Formerly-incarcerated students looking to learn how to work in the hospitality industry spend six months learning the ins and outs of the trade. Successful graduates are now working at top restaurants in Cleveland as well as other cities. It is a non-profit 501c3 organization (and as such does not have a tip line on the bill, but a “charitable donation”). 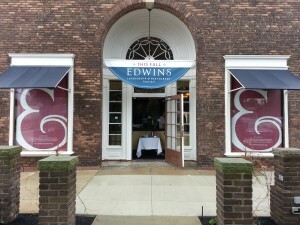 EDWINS’ restaurant sales subsidize the nonprofit’s mission. I prefer to think of it as a delicious upscale French restaurant. This is a wonderful mission and well worth supporting. And a HUGE step up from the previous restaurant that occupied the space, the old Grotto wine bar. This is a welcome addition to Shaker Square. Chef Gilbert Brenot runs the kitchen. I have known about Gilbert since he had his own restaurant (Bistro 82) in Twinsburg and my sister waitressed for him back in college. The man can definitely cook. Everything that comes out of the kitchen is flawless. The restaurant focuses on fine French dining. On the first visit I had a very small appetite, so I ordered a number of appetizers and small plates. I started my meal with a Parisian Mule, which features Tito’s Vodka, Creme de Cassis de Dijon, Fresh Lime, Fever Tree Ginger Bee. It was just as light and refreshing as I expected. I had heard wonderful things about the rabbit pie, so that was a must. The official description is Tarte de lapin au Parmesan et jambon en croûte (rabbit pie with Parmesan and prosciutto crust). The crust was flaky and definitely had a salty Parmesan and prosciutto flavor. Although a little drier than I expected, the filling was extremely flavorful and delicious. Everyone who had a bite of my pie enjoyed it. 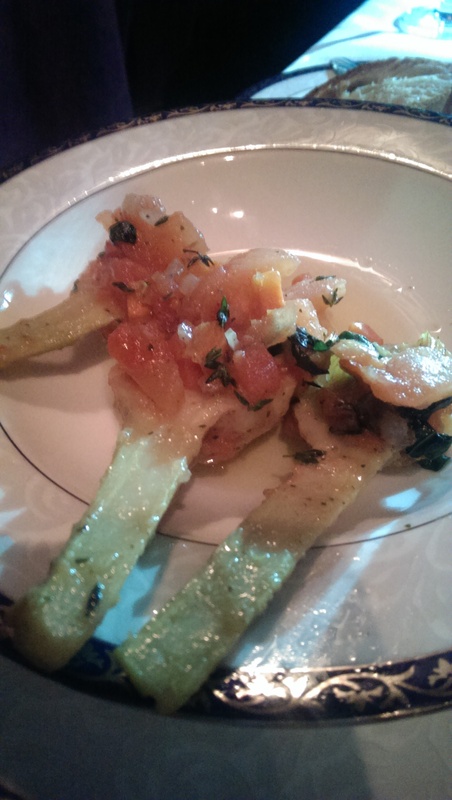 I accompanied the rabbit pie with the Artichauts barigoule (artichokes braised in white wine, olive oil and butter). They were perfectly cooked and were a nice complement to the rabbit pie. I split the Salade Niçoise (a fresh salad with Ortiz tuna, haricot verts, egg, potato, anchovy, tomato, red onion, Niçoise olives and red wine vinaigrette), and they split the salad on two plates for us. This was light and fresh and featured perfectly cooked tuna steaks. 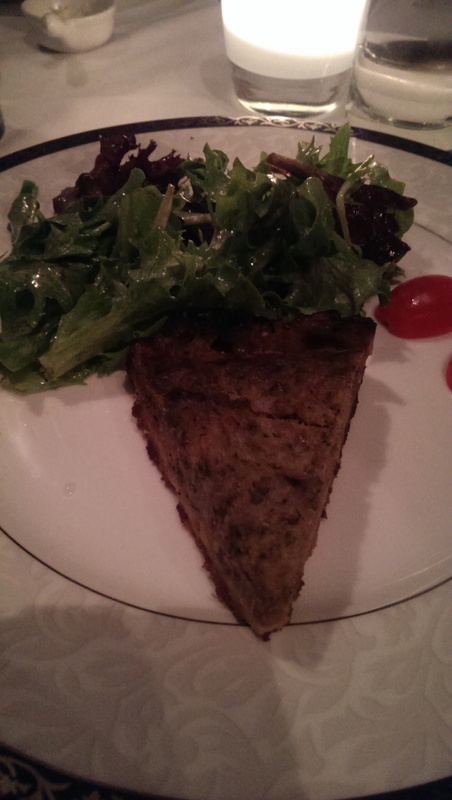 The size is small, but it is a nice side salad to pair with an entree. I splurged on my second visit. 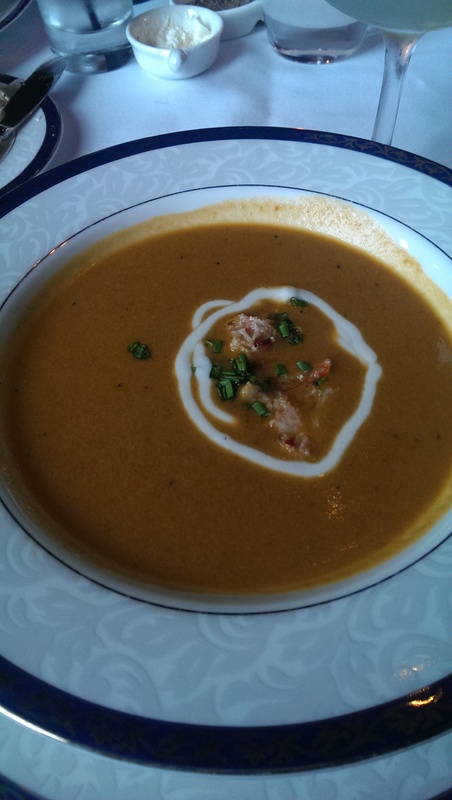 I started with an an Aviation cocktail (Boodles gin, Luxardo maraschino liqueur, crème de violette, and fresh lemon) and the Bisque de homard (lobster bisque). It was very smooth and not overly creamy with fresh lobster meat served in the middle and decorated with a swoop of crème fraiche. 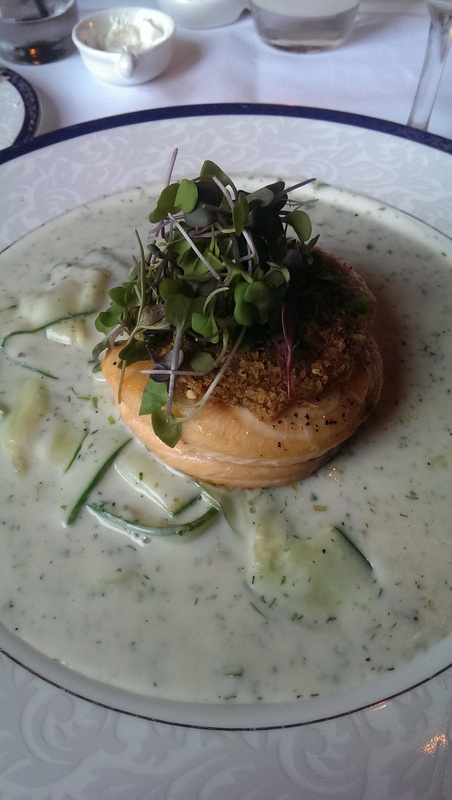 My second course was the Tournedos de saumon gratiné au raifort et sa sauce aux concombres et crème fraîche (horseradish encrusted salmon with cucumbers and crème fraîche), and I paired it with a glass of California Chardonnay. I have to say that this is probably my favorite thing on the menu. 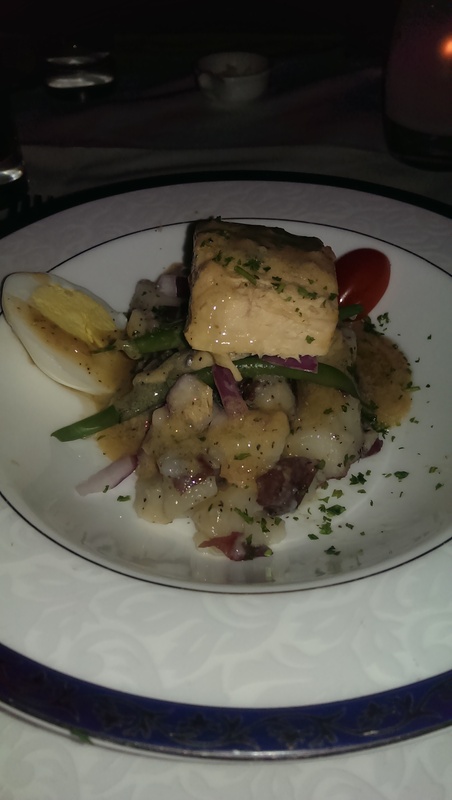 Our server asked how I wanted the salmon cooked, and I left it up to the chef to prepare it as he saw fit. It was perfectly cooked (not too dry and not too moist), and the crème fraîche sauce with dill was the perfect accompaniment. I even used some bread to sop up some of the sauce when I had finished the salmon. Also worth noting is the Ratatouille avec tofu et pistou (Ratatouille with tofu and pistou sauce). The pistou sauce is a tomato-based sauce that was absolutely delicious. One of my friends ordered this and allowed me to taste it. I am not normally a huge fan of ratatouille, but this one has definitely won me over. It is absolutely delicious! Everyone raves about the cheese service, which is very impressive, but for me the star of the restaurant is the Bananas Foster prepared table side. 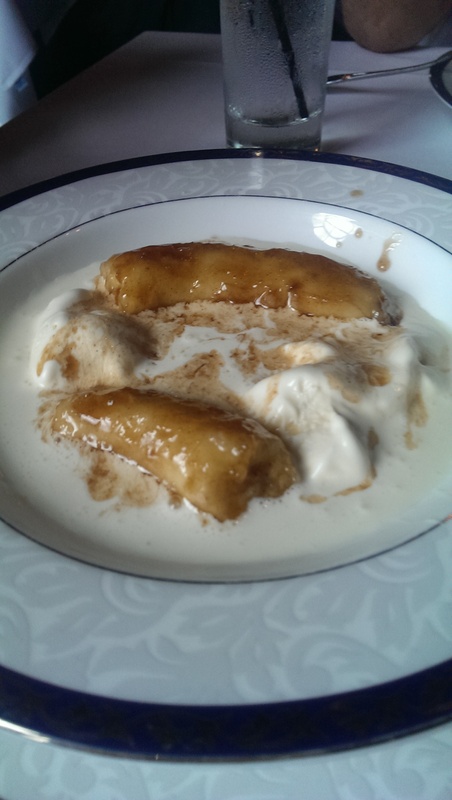 It is a delight to watch – from the melting of the butter, to the caramelizing of the brown sugar, addition of the banana and flambeing with liquors – and even more delicious and delightful to eat afterwards. 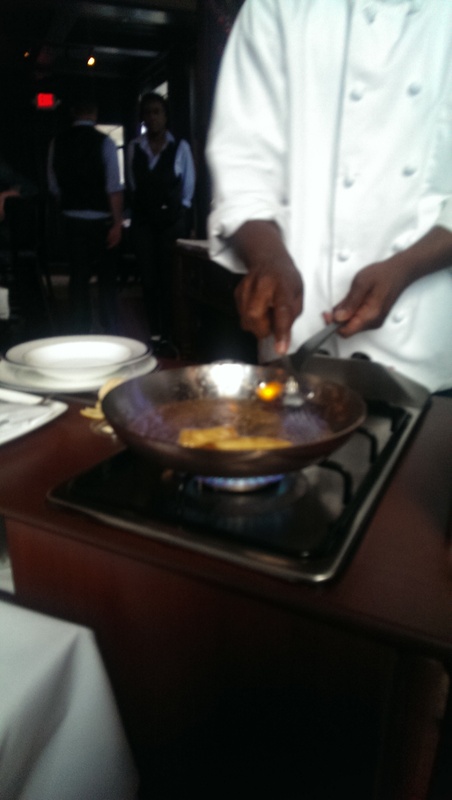 One of my tablemates ordered it, and I have every intention of coming back just for the bananas foster! The gentleman preparing the dessert was a little nervous and had someone whispering what to do in his ear, but he explained afterwards that it was his first time preparing it. He did a wonderful job for a first-timer, and we made sure to complement him to the manager. The créme brulée and soufflé are also outstanding choices. I have been lucky enough to try bites from my dinner companions. The sugar on the créme brulée was perfectly caramelized, and the custard was deliciously creamy. 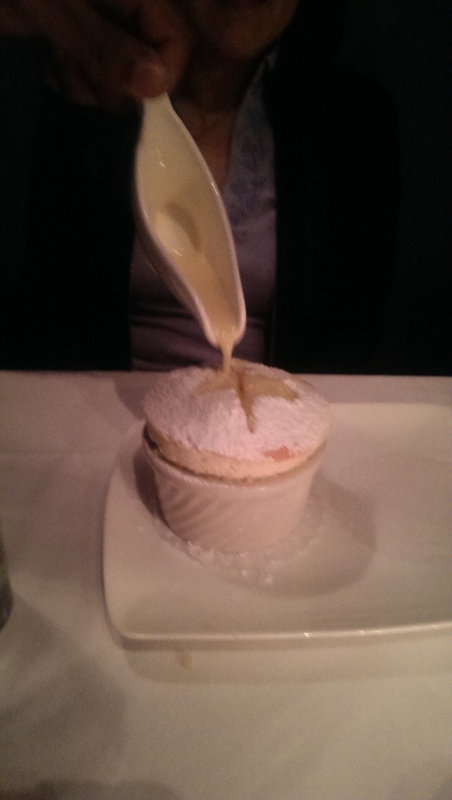 The soufflé was as light and delicious as you would expect. Be sure to order it with your meal, because it takes 25 minutes to make. You won’t go wrong ordering any of the desserts. Even the poached pear is delicious. The service is impeccable – almost too much at times, with several people coming by to ask how everything was. Our water glasses were always full, bread was always replenished, and every tiny request was quickly fulfilled. They definitely get an A++ for service.